1. 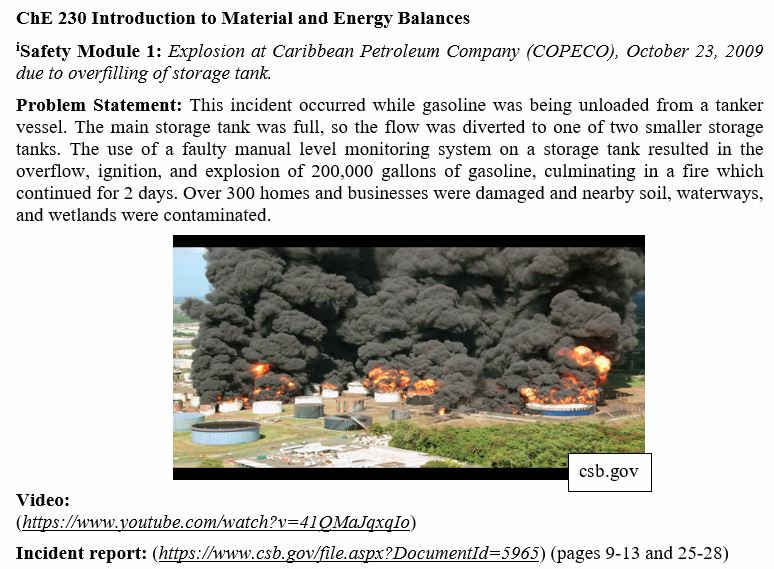 View the Chemical Safety Board video provided. In each safety module, students will be asked to watch a video from the Chemical Safety Board about the incident the module is for. The link to the YouTube video is provided in every problem statement. 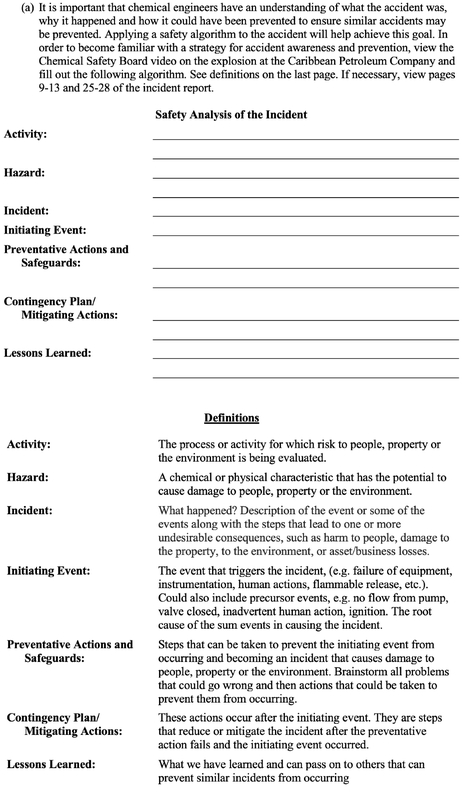 A link to the incident report (if applicable) is also provided along with page numbers that may be relevant to the students’ understandings of the incident. 2. Fill out the Safety Analysis of the Incident in the video. After students have watched the video, they are asked to fill out the Safety Algorithm. Definitions of the different terms of the Safety Algorithm are provided at the end of the problem statement document for students to refer to when filling out the Safety Algorithm. Some modules have "Module Specific" definitions for terms used in the video about the incident that students may have not heard yet. 3. Carry out a calculation related to the video and course. Every Safety Module has a calculation portion. The calculations are related to the incident and help students to quantify what went wrong. The calculations are also intended for the course for which the Safety Module has been categorized for. 4. Fill out the NFPA diamond for the chemical of interest in the video. After the students have completed the relevant calculation, they are then asked to look up the chemical of interest from the incident and fill out the NFPA diamond for it. Information on how to access the NFPA labels for different chemicals are provided in the problem statement as well as in the NFPA Diamond tutorial on this website. 5. Construct a BowTie diagram for the incident in the video. In each Safety Module, students are asked to construct a BowTie diagram for the incident. Information about the different elements of the BowTie diagram are provided as to a link to the BowTie Diagram Tutorial found on our website. For questions or permissions contact kirant@umich.edu.